Happy 10th Anniversary Project Runway! 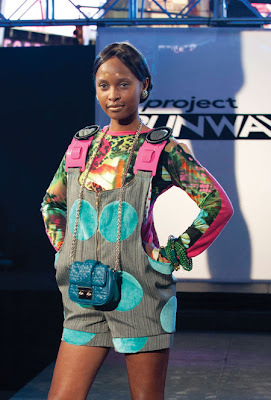 This past Thursday night was the PREMIERE of Season 10 of Project Runway on Lifetime. Yes, kids, it's the Tenth Anniversary. 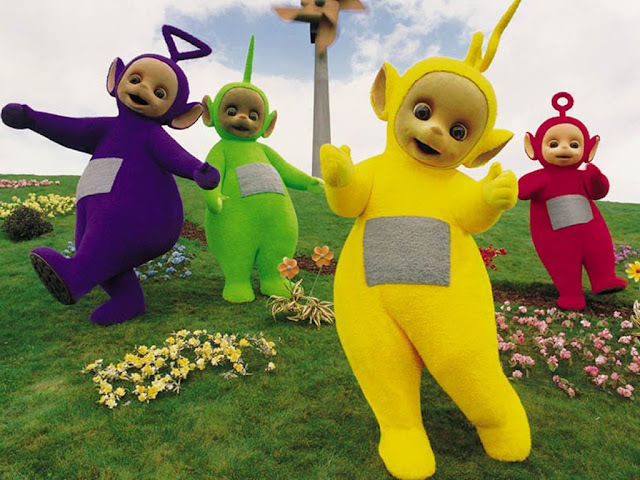 The show began in 2004 so it's actually been only 8 years but TEN SEASONS. I was part of Season 2, which we shot in the Summer of 2005 and debuted in December of that year. So, in case you're countin', I am part of "Vintage Project Runway". Now, back to the new season, the show has a new set of sixteen designers; lots of talent and LOTS of "characters" and a BIG Flashy First Challenge Runway Show (The BIGGEST in Project Runway history!!) that took place in Times Square. For many, many seasons now, I've had the honor of being asked to Recap the Episodes of my "little ol' show" and once again, I'm back at it!! Hope you guys enjoy Season 10 and yes, also enjoy my Recaps with a "Nick twist". The Judges: (left to right) Costume Designer/Stylist Patricia Field, actress Lauren Graham, Marie Clair Fashion Director Nina Garcia, Michael Kors and Heidi Klum--For the first Challenge, the producers brought in actress Lauren Graham and the first ever Project Runway "Guest Judge", Patricia Field. She was a hoot with her throaty I-smoke-two-packs-of-Marlboro-Reds-a-day voice, great insight and at 71 years old (yes, SEVENTY ONE kids, Thanks Wikipedia! ), dresses like a woman who's 29--and looks good! (No Oscar de la Renta Barbara Walters suits for her, thank you very much!). Domo arigato: For the first episode challenge, the designers had to bring one look from home that best exemplified their design aesthetic. Once at Parsons--on the show--they then had to create a "companion look" with only $100 and one day. One of the designers--and more "Kooky" characters of the season, Kooan Kosuke (above) from Japan, made these two looks above. Kooky: His first look from home, included this jumper with oversized teal blue polka dot applique, laminated shoulder strap detail and printed long sleeve top. I thought it was kinda fun and quirky. 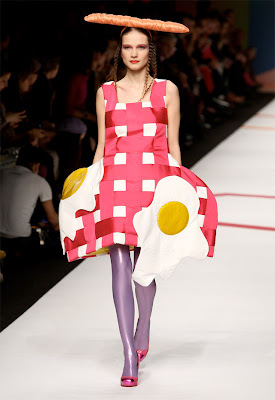 He definitely had a point of view and his style--even in just one look, reminded me a lot of Spanish fashion designer Agatha Ruiz de la Prada (her fried egg dress with baguette hat design on the right photo above). 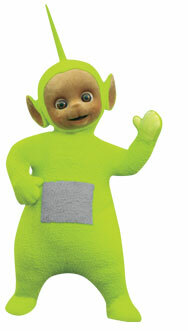 Tubbie: However, for his second made-at-Parsons look, judge Michael Kors criticized it as being a little too Teletubbies-esque in its shape. He's right. Kooan was also criticized by Nina Garcia and Kors as well for possibly being too much of a "Character" and less of a Designer per se. We'll see how serious he is and if he'll annoy Miss Nina more throughout the season with his "Harajuku JapFro" antics. I have a feeling, however that the fans--and viewers of the show--will just LOOOOVE him! 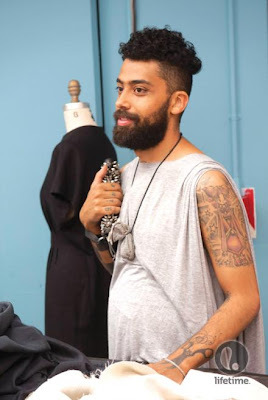 What's for Breakfast: A First for Project Runway is the fact that one of the designers, a 29-year-old bearded chap, originally from Brazil, named Fabio Costa, is a FREEGAN. I didn't even know what that even meant until A) he described it and B) I looked it up (Thanks Wiki again!). In case you don't know, a Freegan is someone who "reclaims and eats food that has been discarded". 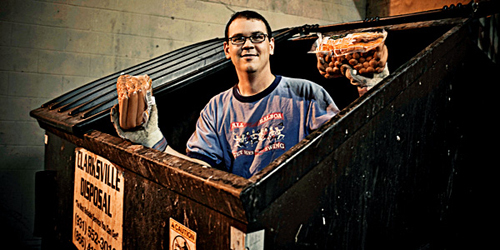 Yep, you go "Dumpster Diving' for your daily meals. I wonder how difficult it was for him to eat from what the P.A. 's got for the designers every day during their filming from nearby restaurants. Or did he specifically instruct the producers that they had to send someone out Dumpster Diving for his breakfast, lunch and dinner? I wanna know. Pretty Gown, Wonky LBD: The winner was Christopher Palu. The judges "Oohed" and "Ahhed" at his first look--a gown constructed in strips of satin. And basically they gave him the win because of it. It was very pretty, but I'm not sure how fair this was since this was the look he brought from home and did not make at Parsons with a limited budget and time. Personally, I wasn't a fan of the LBD he did for his second companion look. The fit was wonky and the back zipper was buckling (see right photo above). It was a little amateur hour for me. But he won, nonetheless. 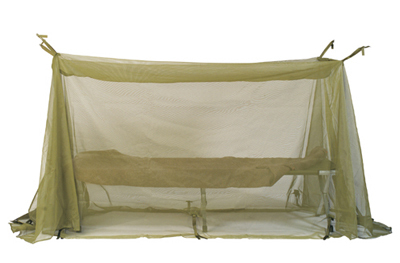 Mosquito Netting Prom Girl Goes Shopping: The bottom two included the looks from designer Lantie Foster. She "re-worked" vintage-like fabrics but achieving results that the judges did not like. In fact, Miss Nina (never one to hold back) said that the one dress above was "Horrible". Ouch. Miss Lantie likes to do these center front bib things that well, she shouldn't be doing. And then on top of it she makes this dress in a muddy-colored tulle that looked like mosquito netting as Kors pointed out. It was all wrong, poor thing (and I didn't even begin to talk about WHY OH WHY did she style it with a big ol' I'm-going-shopping-on-a-Sunday-at-2pm bag!!??). Hashtag Styling Fail. Knit Girl Bye-Bye: But deemed the worst were the knit designs from oh-so-pretty Beatrice Guapo (she should be an anchor--or at least the weather girl for Good Day LA Fox Morning Show--if the designing thing fails). She had trouble throughout this challenge with her sewing which I just didn't understand being that she grew up in the industry. And then her final designs were called sad (they were). That maroon/terracotta-colored top on the left photo looked as if she just got some fabric remnant and slopped it on the model and tied it with a belt. It had little design quality or originality. During the show, Guapo said that she loves designing/making scarves. She should probably stick to that. "A Tenth Anniversary Fashion Party"
Happy 10th Anniversary "Project Runway"! As a member of the "Runway Club" (it's like the Mickey Mouse Club, but more fashionable), it's not surprising that the show has survived this long. Back in 2005, when I did Season 2, I knew that I was going to be part of something that was iconic in TV History. The show premiered almost 8 years ago and well, as we now know, it has become the "Grand-Daddy" of all Fashion Reality Competition Shows. In fact, last week, while on a trip to Mykonos, Greece, I was switching channels and stumbled on Greek TV and guess what was on my hotel TV? Season 6 of "Project Runway"! In Greece! Say no more. 2012 marks the Tenth Season of the show and last night's premiere was a doozy so let's get to the Recap'ing shall we. Since Season 3, I have had the privilege to judge the castings and this past Spring, I took part in the LA Castings for Season 10. I, obviously, had no idea who would make the Final 16, so it was with great delight to see several of the designers I saw during those castings, actually make it onto the show. This included Elena (Miss Futuristic Thierry Mugler-meets-Claude Montana-meets Lady Gaga), the lovely Beatrice "jersey knit" and blonde-haired Melissa, who loves black and edgy. And make sure to let me know YOUR thoughts!! I always LOVE reading them!!! 3 Responses to "PROJECT RUNWAY.....Season 10 Project Runway Recaps: Episode 1 "
Hello, darling Nick! I think that this just might be....a good season! At least we have designers with a point of view, we will have to see if they can do anything beyond their comfort zones. I loved the preshow with you and Mondo, my dream team, too. I love Pat Fields, too, she sound like one of Marge's sisters from The Simpsons and I, being over 60 myself, appreciate that she doesn't roll over and dress like an old lady, I won't do it either! I look forward to hear your thoughts over the season. Do you see a front runner yet? Kooan Kosuke is Kooky alright.. I am hoping it was only first time stage fright and he gets past it.. I could hardly stand to watch the segments with him... He needs to step it up a lot of notches on his designing..
Chris's second piece was creeping up the front of the model's body the whole time she was standing there.. He even pulled on it at one point...?????? Ven's clothing are the supreme of supreme! He is a fantastic designer and sewist! I don't think Beatrice has had much practice with sewing due to her comment in the sewing room... Almost like last year's contestant Anya ... although she was a very fast learner and won the show! And deserved to win as well! I LOVED her clothes and would wear them in a heartbeat! Uncle nick! Why didn't Ven win, do you think? And how is it that Lanti could get away with revising a vintage dress? Is being boring really the one unforgivable fail on PR? So glad you're sticking with this gig!